Certainly a million to one shot, this old-school punk band with rock chops dominated Winnipeg's scene in the early 80's thanks in no small part to the antics of barrel-voiced wildman Mitch Funk, who Springsteen would surely admire if he knew of him. Plus, doesn't "Twilight's Last Gleaming" just sound like a Springsteen song title already? 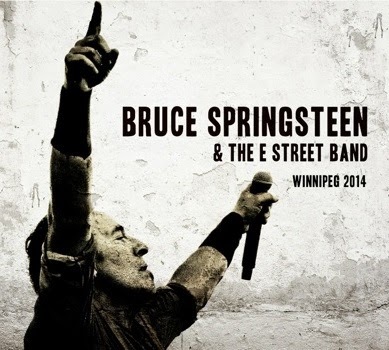 Okay, Bruce (and half of the world) may still harbour mixed feelings about this sentimental song from one of Winnipeg's less celebrated pop figures but it has that epic grandeur in both the chorus and the story-line that would make it fit right into Springsteen's wheelhouse. Another daringly unlikely choice would be for Bruce to cover a song from the Winnipeg's political thrash lords, whose riffy song about father-son relationships and U.S. imperialism (that's just how those boys roll) is pretty catchy and would be given a twist by that Springsteen intensity. While intense rocker Macpherson doesn't hide his adoration of Springsteen, his own brand of music is strikingly singular and Springsteen could do a fantastic Nebraska-esque take on this train ballad of the frozen North. Thematically and musically this chestnut hits all the Springsteen buttons and would have the added benefit of not being "Takin' Care of Business", which at this point has just become part of the musical furniture. Hatcher is just the kind of tenacious, gifted rock n' roll lifer (like Willie Nile, Southside Johnny or Jesse Malin) that Springsteen admires and invites to share his stage. This soaring kiss-off song by The Blue Shadows (with Billy Cowsill of The Cowsills) would be electrifying in a Bruce-E-Street context. Another slightly purple bit of melodic melodrama from the seventies that would get pumped up to gargantuan-proportion by the man and his band. Bruce keeps his ear close to the ground, music-wise, so I suspect he's aware of John K. Sampson & co.'s wordy folk-rock. While the most known entry in the Weakerthans' catalog would be "One Great City", that song's "I Hate Winnipeg" chorus would make it a tough sell for a visitor, even for one of Bruce's stature. "Anchorless", on the other hand a finely-detailed song about the "small towns that we live and die in" would speak very directly to experiences shared by performer and audience. When it comes to Winnipeg's most famous musical export it's a toss up* between "Shakin' All Over" (already a cover) which would indulge Springsteen's love of early sixties rock that he can stretch out into long vamps and "Share the Land" which plays to his love of social justice mixed with a good tune. Your call, Mr. Springsteen, your call. *"American Woman" is not only too obvious, it's brand of anti-Americanism doesn't jibe with Springsteen's more subdued criticism of his homeland. 1. Neil Young "Long May You Run"
There's no question that "Heart of Gold" would produce a rapturous response and be a fantastic choice (as would other Young songs including ones Bruce and Neil have sung together like "Helpless" and "Keep on Rockin' in the Free World"), but "Long May You Run' has those Bruce motifs of running and remembering that would make for an epic show-closer! Plus, Springsteen must be aware that when Bob Dylan came to town he headed straight over to Neil's first rockin' abode as soon as his show was done. Bruce, let me just say that I guarantee you that we will lead a goddamn parade to Neil's house with you as the Grand Marshal if that's what it takes to get you to visit our One Great City. So, those versed in Springsteen and Manitoba history, what do you make of these choices? Were there stunning choices that were missed? Let us know in the COMMENTS section! Dubious Suggestions: Fred Penner "The Cat Came Back", since even bad ideas, like Springsteen doing a beloved kids song, can make for good entertainment, The Crash Test Dummies "Superman's Song" who's solemn lament for the original superhero would fit Springsteen's vocal and narrative range nicely and Venetian Snares "Winnipeg is a Frozen Shithole" the longest of the long-shots for many, many reasons which are none too hard to discern.